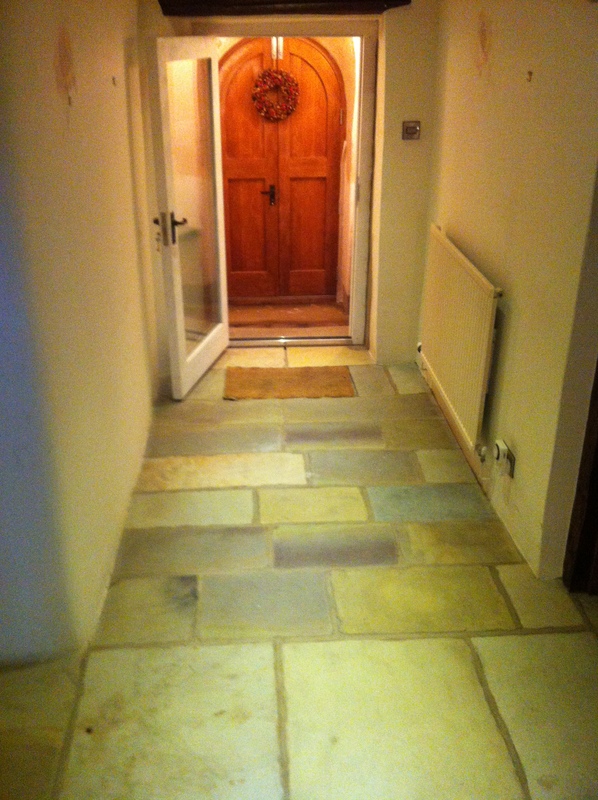 York stone is a very hard wearing material and is often the surface of choice in cottages and farmhouses. This wonderful farm house in Aldington in Cheshire, just past Prestbury and Alderly Edge, had a York stone floor that had a large amount of builders residue and dust on, from a recent full house renovation. The dirt and dust had settled on the surface of the stone flags and was hiding the wonderful colours, which were contained in the York stone flags. 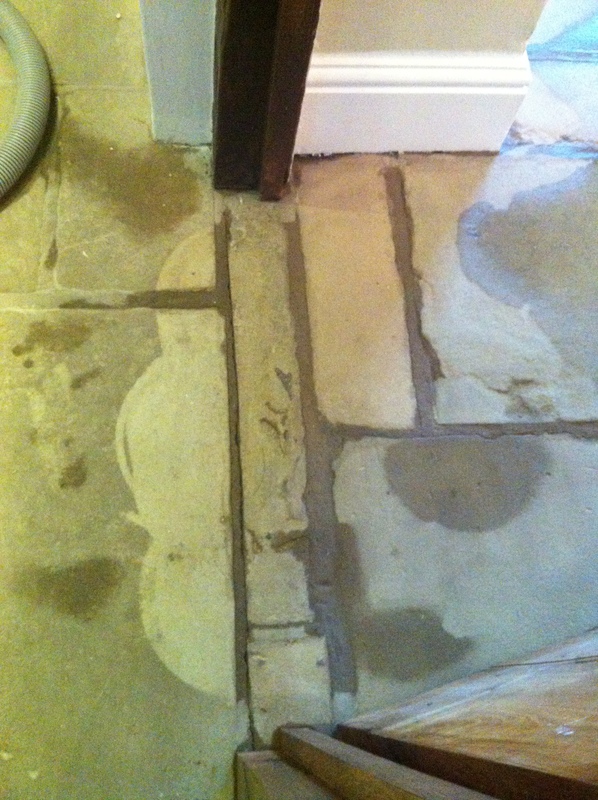 To remove the dirt and soilage from this York stone floor, and specialist solution is applied. 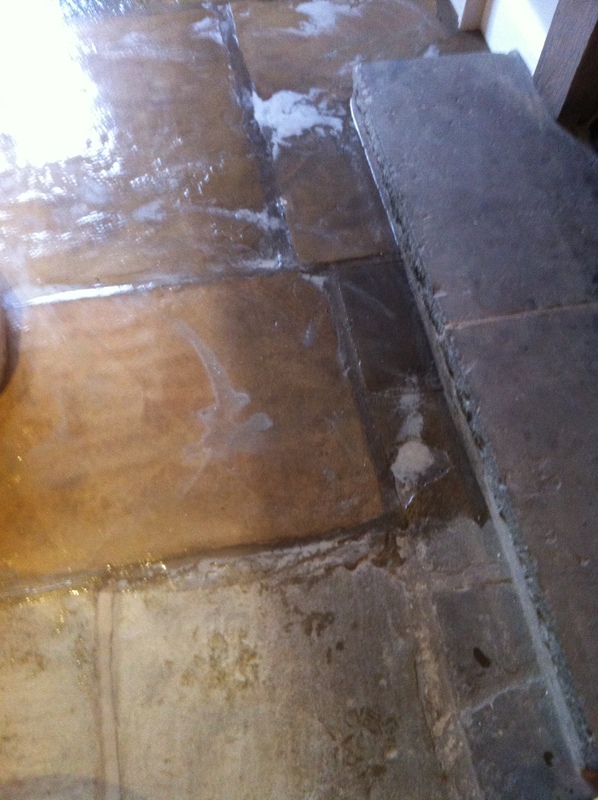 The solution that we use is Cleaner No2 – Natural Stone Clean, from “The Tile Master”. This is a great product as work well with even just a nail or hand brush. 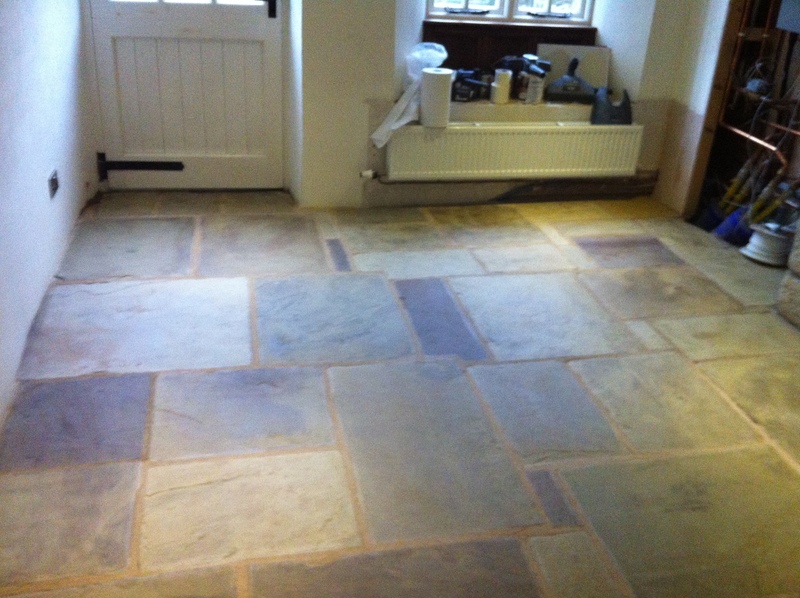 For more info on this Natural Stone Cleaner visit http://www.thetilemaster.co.uk/apps/webstore/. This is a safe but strong cleaner that eats away an years of build up dirt and soil, breaking the bond between its self and stone tile. 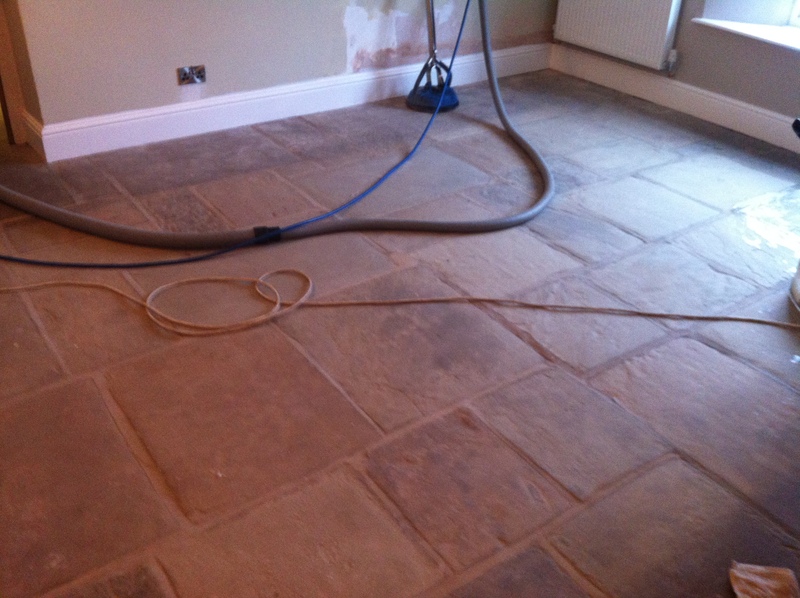 One the solution has had time to work, the York stone flags are specially scrubbed using a state of the art floor machine. With an abrasive brush on the floor machine, this scrubs and agitates the dirt’s and clean not only the flat stones and the grout, but in all the uneven ridges and pits. Using a standard floor pad would miss a lot of hard to reach areas and in turn the results would not be as good as our cleaning system. 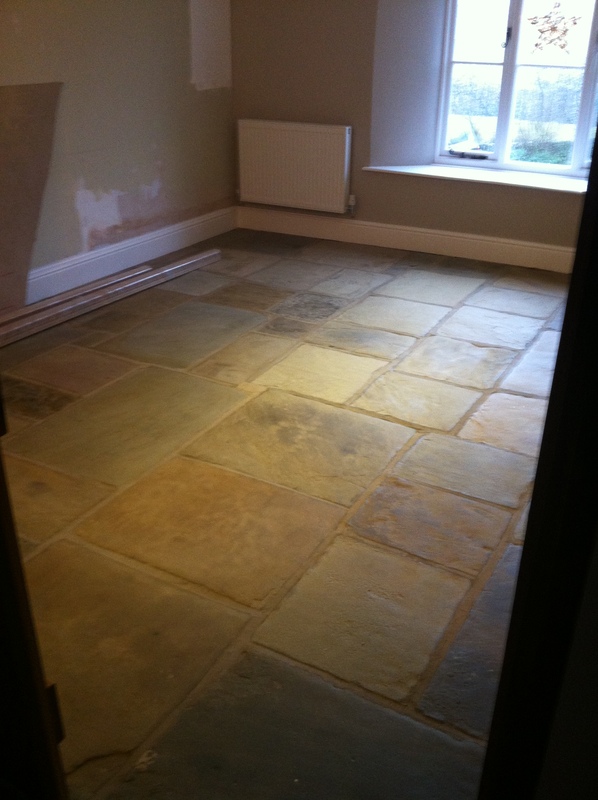 Once the solution had been agitated with the deep scrubbing action of the floor machine, the York stone flags were then ready for rinsing. To rinse the york stone flags our state of the art high pressure, hot water extraction tool is use. This is similar to a jet was spinning tool use to clean decking. The machine pumps out hot water at high pressure and cuts through the soil and dirt. This is then instantly extracted using the powerful vacuums and all the dirt is collect in our large waste tank outside. the best way to see this process is with the video below. The process can be repeated till the desired results have been achieved. Once the floor has been cleaned there can be some dramatic results. Below are some pictures of the floor during and after the cleaning process. Below you can see the results that are achieved in the entrance hall of the house. 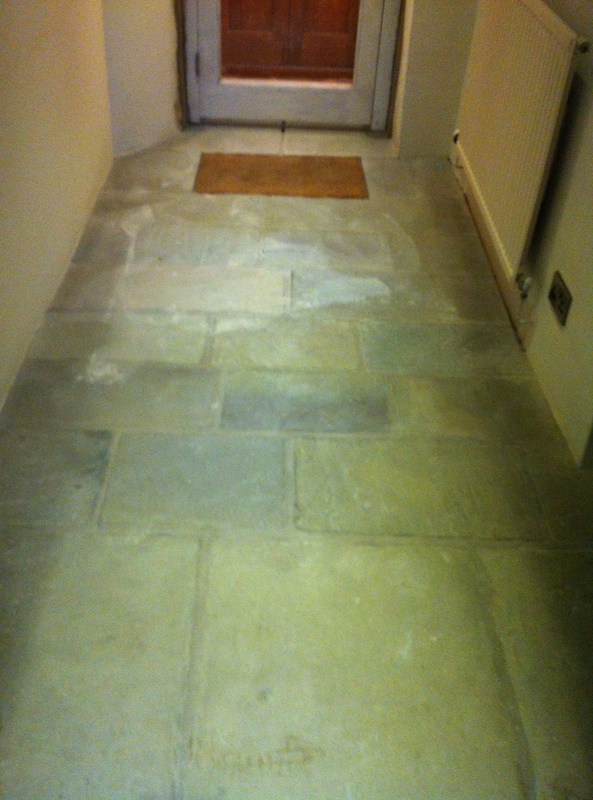 This picture below shows the flags stone after been cleaned. Once the floor was completely cleaned, the area was then left to dry over night, so that it could be sealed in the morning. The penetrating sealer was applied to prevent water and oil based stains and dirt soaking into the tiles. This helps to seal the pores of the tiles and close up the surface tension, making the York stone flag easier to clean and seal. Check out our tile and grout cleaning page on our website, for a full list of surfaces that we clean. More Pictures Below of the finished work. This entry was posted in cheshire flag stone cleaners, cheshire york stone, cleaning flag stones manchester, flag stone cleaning, flag stone cleaning cheshire, how to, How to clean tiles, impregnator, mamchester stone repairs, manchester stone cleaning, stains in york stone floor manchester, stockport york stone cleaners and sealer, Stone Issues, Stone Repairs, Stone Restoration, Uncategorized, w to seal york flag stone, york flag stone cleaning, york stone cleaners manchester, york stone cleaning and sealing, york stone stain removal and tagged builder, care, Cheshire, cleaners, cleaning, dirt, dust, Fila, fila ps87, flags, floors, grout, how, life, lithofin, ltp, Manchester, new, newlife, removal, resotration, restore, sealers, stain stop, stains, Stockport, stone, stonecare for you, stonefix, Tile, to, york. Bookmark the permalink. Do you take in work in Norfolk please?